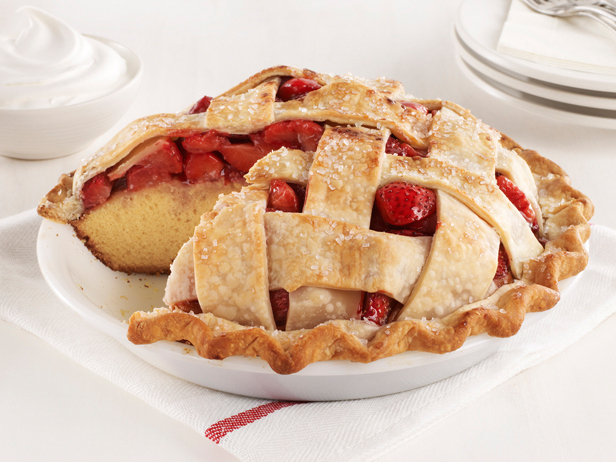 The Original Strawberry Pie Cake Recipe. You Saw It Here! / Hey, EEP! The Original Strawberry Pie Cake Recipe. You Saw It Here! 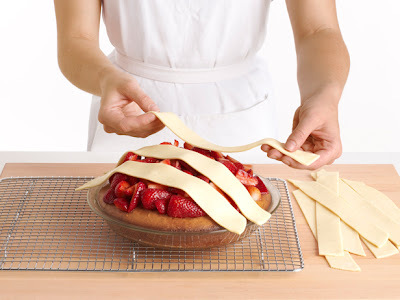 Next, cut out pie dough strips for the lattice crust. 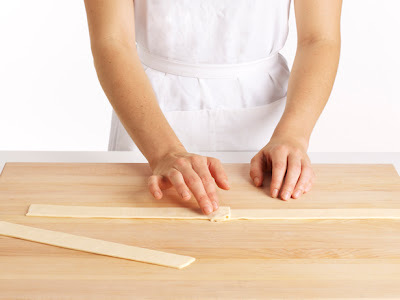 And press a few strips together to make 1 long pie dough rope. (This turns into the fluted edge). 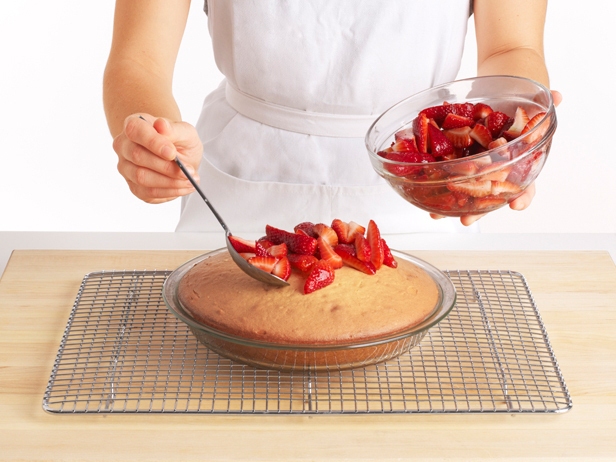 Let the cake cool a bit, then top it with the strawberries. 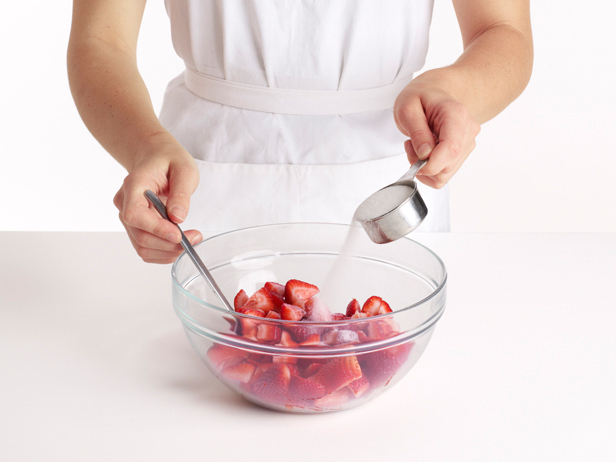 I like to really press them into the top of the still-soft cake so I can get the most berry-action possible! Then you build the lattice crust right on top of the cake. Make sure the plate is cool enough to handle or the dough with get too soft, too quickly. 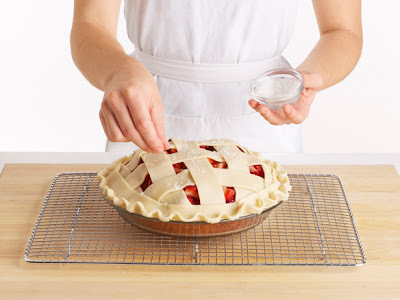 Do you all know how to make a lattice crust? 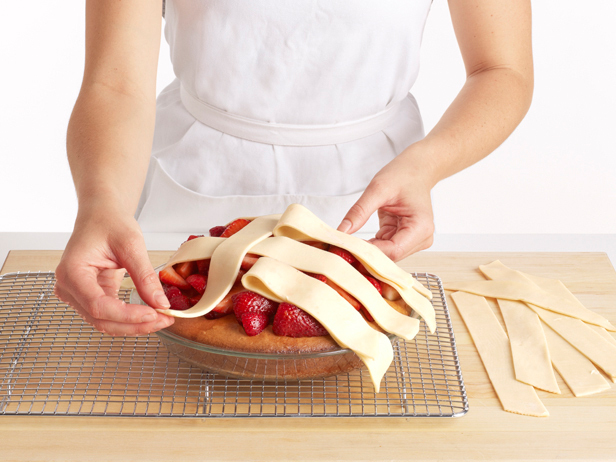 You start by arranging pie dough strips in parallel rows about 1 inch apart (in the case, on top of the strawberries). 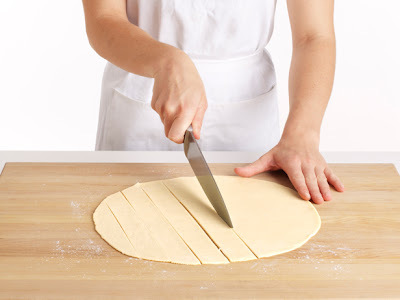 Fold back every other strip halfway like you see in the photo, below, then lay a strip of dough across the center of the pie perpendicular to the original strips. Unfold the strips over the perpendicular one. Repeat, alternating the strips you fold back, to make a lattice pattern. Since there isn't a bottom crust to crimp, I make a faux–fluted edge by roping that long strip of pie dough around the rim of the pie plate, pressing the ends together. 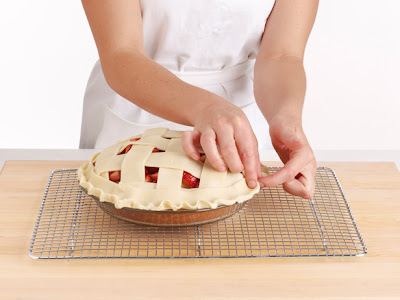 Tuck the edge of the dough under itself, then crimp as you would a normal pie crust. Sprinkle the top of the pie with a little sanding sugar before you pop it back into the oven. A few minutes at 450˚ will soften the strawberries, finish the cake and will make the crust crisp and golden brown. Serve this a la mode or with a big scoop of whipped cream!